Hello Loves. April is Autism Awareness Month, and this is a cause very near to my heart. Naturally, I had to do a little nail art to show my support. Before we get to the details of the nails, I want to tell you a little about why Autism Awareness is important to me. Her name is Leanne and she is a vital part of every holiday memory I cherish. Leanne is my cousin and she is autistic. As a grown woman, she has the mental capacity of a young child. Leanne is a very affectionate woman with fondness for necklaces, purses, baby dolls. Any time you see her, you can almost bet she'll be wearing at least one string of beads, a pocket book thrown over her shoulder, and a baby doll hanging out of the pocket of her shorts. Life for Leanne is challenging. Not only does she struggle with communicating her thoughts and feelings, but others who are not familiar with the various levels of autism are often unsure how to act around her. Some even forget their manners completely. Oh the times I have wanted to punch people for their rude comments in public, but I digress. Autism impacts people in varying degrees. You can take one look at Leanne and see that she has a disability. For others, it is not so obvious. Yet every form of autism has challenges, both for the autistic people and those who love them. You may be wondering what you could possibly do to help the lives of those impacted by autism. 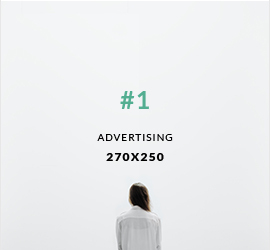 There are a tons of ideas in the link below, but there is one thing you can do that is powerful and won't cost a single dime. When you encounter an autistic person in public, take a moment to catch her eye or her caregiver's eye and smile. Just a simple smile from one person can easily outweigh any negative remarks or actions from another. Everyone can afford to spare a warm smile, right? I encourage you to take a few moments to learn more about autism and how you can help. I could go on and on about Leanne, and believe me, I am tempted! But you're here for the nails, so let's get back to that. Here's a closer shot. I started with a base of Couture Naughty-Cal. I then scrubbed Artsy Fartsy Crafts Ultrafine Blue Holographic glitter into the tacky layer at the cuticle and used a nail art brush to drag the glitter down the nail to create the fade. I should have pulled the glitter down a little farther on the index nail, but no one is perfect. For the accent nail, I mixed the blue holo glitter in with a drop of top coat to make a semi-thick paste. I then dotted it onto the nail in the shape of the puzzle piece. Once I had the general shape, I used a cleanup brush to push any stray glitter into place and cured for 30 seconds in my LED lamp. This is the same technique I showed in my Holiday Glitter Ruffian tutorial. Here's the swatch picture of Couture Naughty-Cal. This is one of my favorite light blue creams. 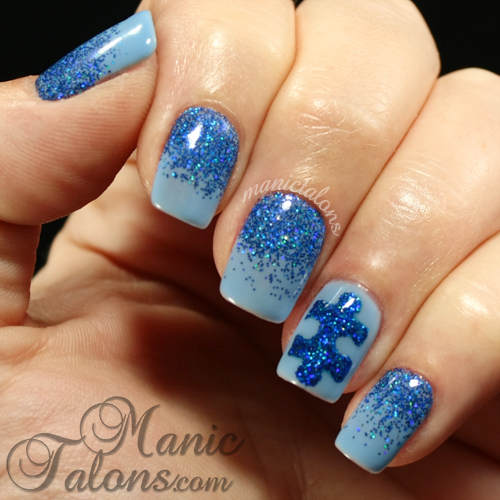 Be sure to check out some of these other amazing blue manicures for Autism Awareness! Finally, I have a few discount codes to share with you. Couture Gel Polish has graciously given me a discount code for 10% to pass along to you! Enter "ManicTalons" at checkout to claim your discount. Additionally, ArtsyFartsy Crafts also has given me a discount code to share. Enter "MANICTALONS" at checkout for 10% off. Oh, and stay tuned for an ArtsyFartsy Crafts glitter giveaway later this month! *The polishes featured in this post were provided by Couture Gel Nail Polish for my honest review. This is stunning. I love the blue glitter puzzle piece!